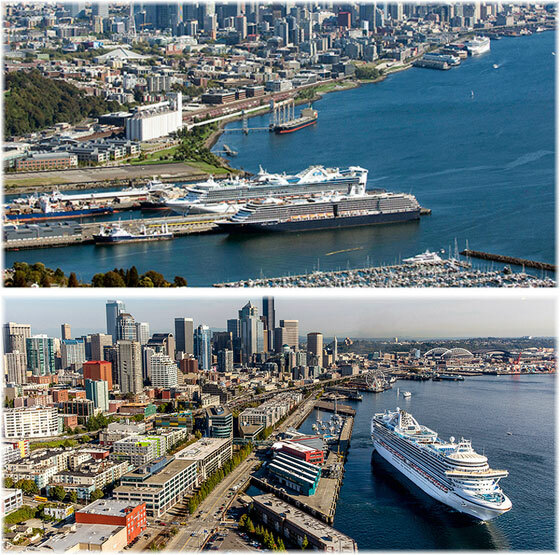 In 2017 over a million people cruised to and from Seattle, with the average ship call producing $2.7 million in local revenues, and the port now boasts nine cruise lines that are make a base there. Next year will also see 4,100-berth Norwegian Joy join her sister ship Norwegian Bliss operating 7-night cruises between Seattle and Alaska. The Seattle-based cruise lines include Carnival, Celebrity, Crystal, Holland America, Norwegian, Oceania, Royal Caribbean and Seabourn. In addition, locally headquartered cruise lines include Holland America, Seabourn, Un-Cruise and Windstar. To handle in excess of a million passengers the port has equipped itself with two cruise ship terminals, the Bell Street Pier at Pier 66 and the SmIth Cove Cruise Terminal at Pier 91. Riding along on this wave has been the Canadian port of Victoria, which has benefitted from coasting regulations that require foreign-flag ships cruising from US ports to make a foreign port of call before returning to the US. Thus Victoria is often the last port of call before the ships return to Seattle. 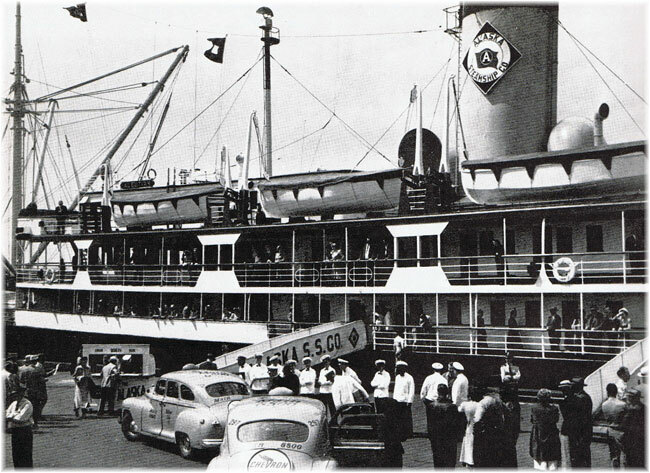 For years until the Alaska Steamship Company closed its passenger services in 1954, Seattle had been the prime passenger port for Alaska, assisted by Canadian ships running up the coast from Vancouver. When cruise traffic first began to revive in Seattle in 1999, traffic was meagre. Six ships handled 6,615 passengers. But in 2018 that is expected to reach 1,092,345 passengers on 122 ships. The average shipload will have risen from 1,102 in 1999 to 5,152 now. Although there is some double counting here for ships that both embark and disembark passengers in Seattle. Overall the Port of Seattle now handles 265 times more cruise traffic than it did two decades ago, in a remarkable period of growth. In Cadiz last week, all four ships of the Fred. Olsen Cruises fleet came together to celebrate the 170 years of Fred. Olsen’s involvement in shipping. 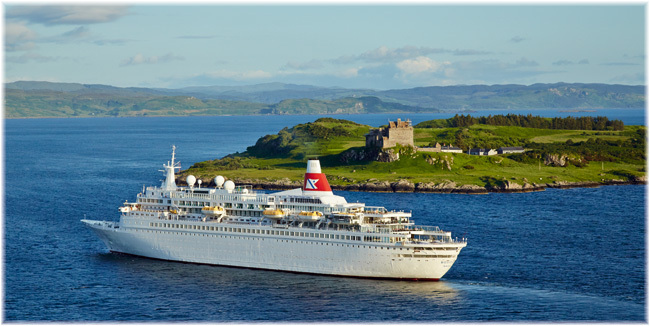 They gathered having sailed from four different British ports, the 1,747-berth Balmoral from Newcastle, the 839-berth Boudicca from Dover, the 930-berth Braemar from Southampton and the 804-berth Black Watch from Liverpool. 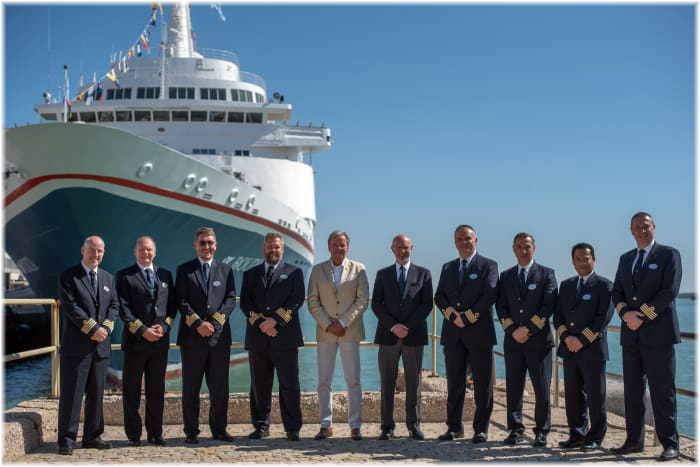 The British-based cruise line is Norwegian owned, part of a huge family empire. The family’s influence shows up in the choice of artworks, often by contemporary Norwegian artists. The passengers are mainly provincial British, often elderly, and many are enthusiastic repeaters. The ships tap into these local markets by sailing out of several ports around the UK. The ships are small by modern standards and two (Black Watch and Boudicca) are over forty years old. But huge amounts have been spent updating them, including new engines, generators and propellers on Black Watch and Boudicca, which originally entered service more than four decades ago for the Royal Viking Line. One of Fred. Olsen’s big selling points is the number of ports it visits, over two hundred each year, and the way they can get upriver to places such as Seville. The 2,900-berth sister ship to the revolutionary Celebrity Edge will be named in the UK and based in Southampton for its first ever cruises, it was announced last week. Celebrity Apex, the second “Edge” class ship from Celebrity Cruises, will be christened in Southampton in April 2020. The news was announced at a preview of Celebrity Edge, which will make its maiden voyage from Florida this November, at Chantiers de l’Atlantique in St Nazaire. Basing Apex in Southampton will be the first time that Celebrity has operated two ships from the UK’s busiest cruise port, with the 2,850-berth Celebrity Silhouette returning there in 2020 for its third consecutive year. The Celebrity Silhouette succeeded sister ship Celebrity Eclipse, which first began sailing from Southampton ten years ago.